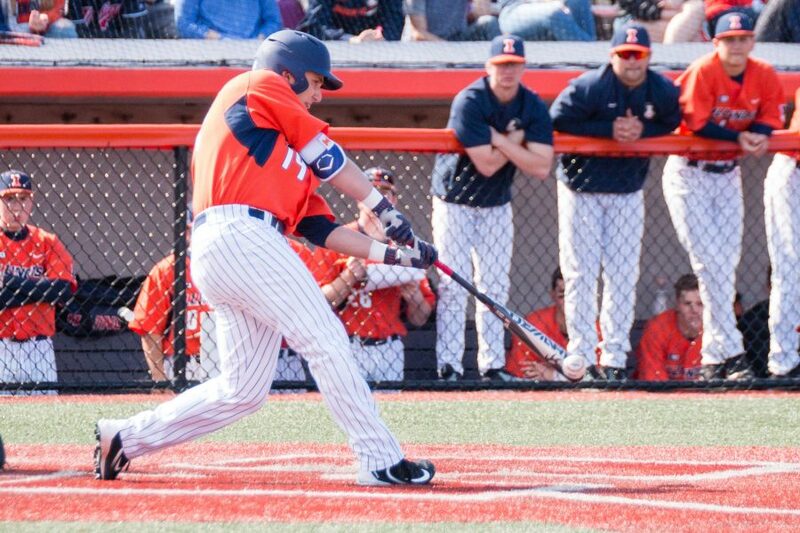 Illinois' Dan Rowbottom (19) takes a swing against Indiana State on Saturday, April 1. 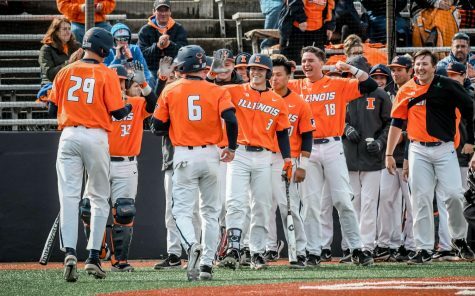 Illinois defeated Western Michigan 13-3 Tuesday. 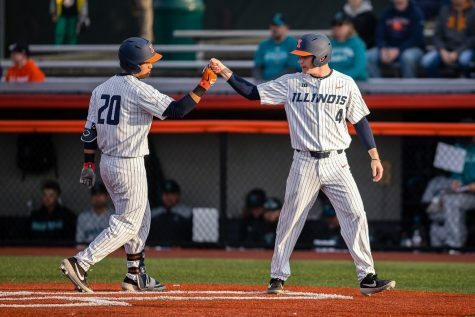 Illinois baseball ends its five-game road trip Tuesday night when it squares off against Illinois State (9-20, 0-3 Missouri Valley). The team has split the first four games on the trip, sandwiching a pair of rough losses at No. 18 Michigan with quality victories over Missouri and the Wolverines. 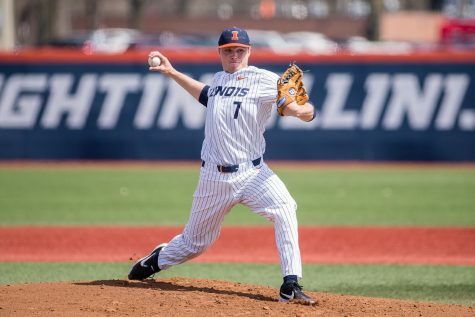 The Illini (11-18, 1-5 Big Ten) shut down the Redbirds on March 21, 7-1, a matchup that had head coach Dan Hartleb using six different pitchers. 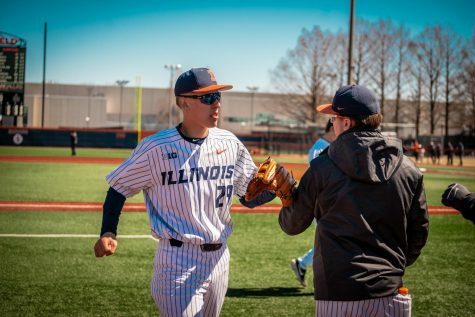 Illinois has wins in five of its past seven games, while the Redbirds have dropped five of their last seven contests. 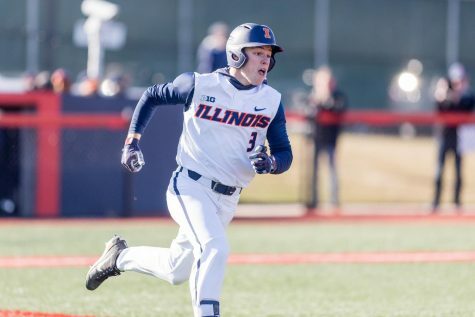 Another Illinois win secures a season sweep over its in-state rival. Hartleb said Illinois cannot take ISU too easily, considering both teams are still well below .500 overall. 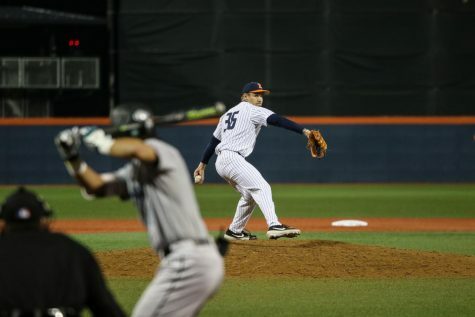 Senior Matthew James, a native of Normal, Ill., will get the nod from Hartleb to start on the mound. James started at Duffy Bass Field last season and struck out a career-high six Redbirds in four innings. “We’ll hopefully get into some later innings from him,” Hartleb said. 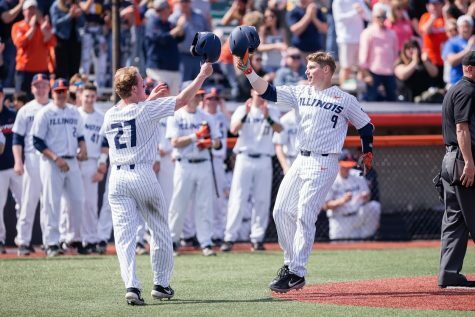 Illinois returns home this weekend for a series with Big Ten rival Northwestern. With a young starting rotation and a slow start to the 2017 season, Hartleb’s team has been reliant on the bullpen to eat up innings and keep it close late in games. The bullpen trio of freshmen Ryan Schmitt, Ryan Thompson and sophomore closer Joey Gerber was lights out over the weekend at Michigan. 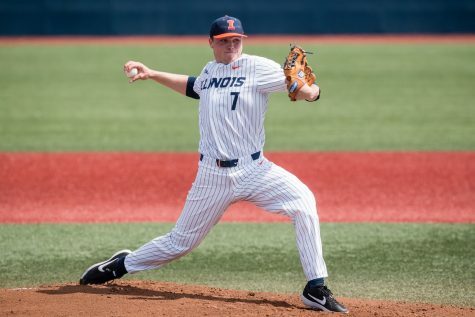 The pitchers combined for five innings of relief and allowed zero runs in Illinois’ Sunday win. Gerber has been effective out of the bullpen as of late. He has 10-consecutive outings allowing zero runs and 24 strikeouts in 18 innings this season. Hartleb attributes Gerber’s dominance — and team-high four saves — to his secondary pitches like his slider. He said it’s still Gerber’s fastball that is the most lethal. Entering Sunday’s matinee in Ann Arbor, left fielder Dan Rowbottom was 1-for-16 in the previous five games. Rowbottom’s .157 average is also the lowest of any Illinois starter. Hartleb continued inserting the redshirt junior into the lineup knowing it would pay off eventually. 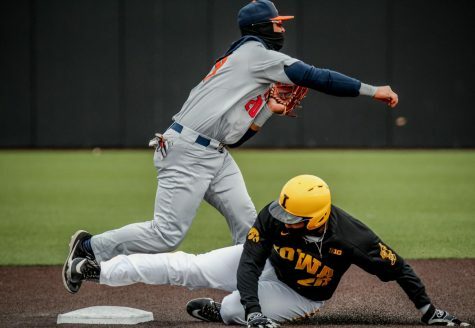 Rowbottom snapped out of the slump with a three-run homer to right field in the third inning to extend Illinois’ lead to six runs over Michigan. 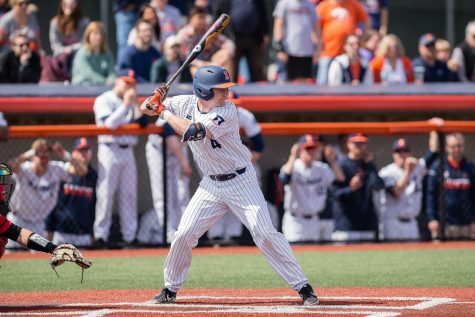 Rowbottom finished the series finale going 1-for-4 with three RBIs and two runs scored.